LIMA — The woman couldn’t see anything and was using her hands to slowly shuffle her way down the hall. She could barely hear the breathing of her friends over the what sounded like the building breathing. The musky scent of mold assaulted her sinuses and made her throat burn. A sudden gasp from her friend behind made her jump forward slightly and her heart began thudding in her chest. Her friend began to scream as an evil cackle filled the air and a wicked voice whispered from the dark promising unimaginable horror. Her terror filled screams joined her friend’s and were so loud the people waiting in line outside the haunted house could hear them. Over the years, Halloween has become like Christmas, no longer just one day but an entire season starting at the end of September and going through Oct. 31. Unlike Christmas, Halloween is about finding pleasure in scaring yourself by watching horror movies and visiting haunted attractions. There are a few such attractions in the area operated by people who enjoy telling scary stories and find pleasure in scaring other people. 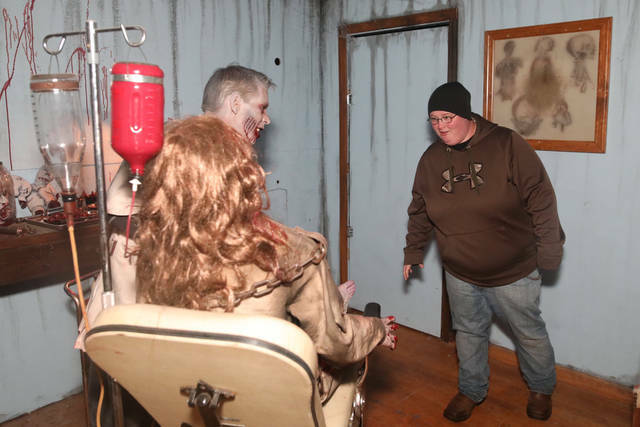 David Neff, of Lafayette, and Ned Baughman, of Westminster, have turned the old Lafayette town hall, built in 1899, into an area haunted attraction. The building was also used as a courthouse — the original jail cell is part of the attraction — as well as a library, schoolhouse and firehouse, Neff said. The attraction’s story revolves around the evil Mayor Joseph, who began his time in politics as a good man but was corrupted into a man who tortured and killed people. The town hall is two stories and has a wide assortment of rooms with different themes taken out of the building’s history. There’s a courtroom where a ghastly judge passes judgment on visitors, a school room where an undead child or teacher waits to torment the living and even a shack where a crazed hillbilly, executed by Mayor Joseph, lurks with the hopes of adding visitors to his trophy collection. Joseph’s evil infected everyone around him bringing out their worst aspects to haunt the town hall after death. The town hall looks run down, both outside and in, but in order to pass inspection Neff and Baughman have put a lot of work into making sure the building is up to code every season. Each room looks like it hasn’t been maintained since 1899, but it’s all due to Baughman’s creativity. Neff said he does the programming and wiring and Baughman adds mold, blood splatter and other design effects. His artistic spark shows in the kitchen where blood is splattered across the walls, ceiling, oven and refrigerator, grisly reminders of the inhabitants preparing cannibalistic meals. He said a lot of careful thought went into placing the bloody hand prints and splatter in believable locations around the room. The Lafayette Haunted Town Hall has very few animatronic characters. 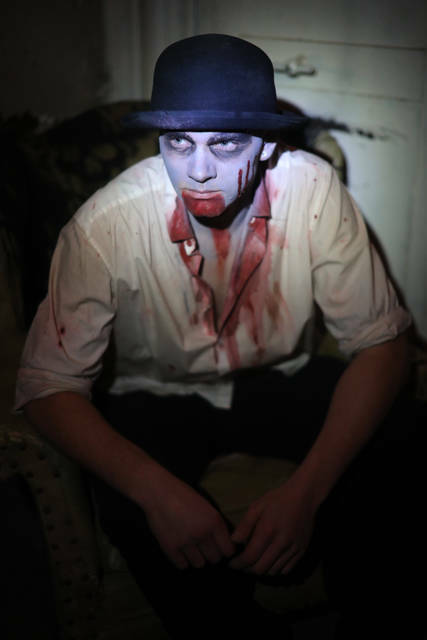 Volunteers from Neff and Baughman’s families, friends and even local residents play roles in the haunt. The two men used to take turns playing Mayor Joseph until the attraction became so popular they had to spend more time managing and less time acting, Neff said. “They enjoy scaring people as much as we do,” Baughman said. Running the haunted town hall doesn’t really net them a profit, the two men said. It’s more like a large and expensive hobby for them. Whatever profit they make each year goes into improving existing rooms or adding new rooms during the offseason. Neff and Baughman also offer a quick escape room separate from the haunted town hall people can participate in while waiting for their turn to experience the haunting. Not every haunted attraction in the area goes with the traditional ghost haunting approach. The story of the Hammer Brothers Haunted Circus in Waynesfield revolves around two brothers who murdered their father and the owners of a traveling circus staying on their property to further one brother’s mad experiments into genetic experiments with corn and the other’s interest in funding to keep the farm. The haunted cornfield attraction has genetically modified clowns and farmers running around trying to kill people and protect the corn. Instead of using Halloween staples of ghosts, goblins and demons, the haunted circus is taking real-world concerns and fears and amplifying them to turn anxiety into a dose of terror. The haunted circus also offers a zombie paintball wagon attraction where children and adults ride along a set track shooting actors dressed as zombies. Gossard said the ride takes anywhere between 15-18 minutes to complete. The attraction Gossard is most proud of is The Hunt, he said. Teams of four enter an arena armed with AR-15 paintball rifles with limited ammunition and they must complete missions like rescuing scientists and escorting survivors all while competing with actors behaving like fast zombies, and not the slow walkers from The Walking Dead. He said the haunted circus in one of only two haunted attractions in America offering this kind of live, first-person shooter experience. The average group of people participating in The Hunt travels an average of one hour and 45 minutes to the haunt. He’s had people travel 8 hours to play. This year, a group from Texas reserved a time to experience the attraction, he said. Gossard said The Hunt is a natural progression from the zombie wagon rides. Those were once a novel idea, but now there are people who don’t want to just sit in a wagon shooting at stationary actors dressed like zombies. People want to have a visceral experience and have the rush from feeling like they’re in danger. They want an experience like Zombie Mode in a Call of Duty game or a dose of The Walking Dead and be on the ground with the zombies to see if they can survive, he said. None of the attractions at the Hammer Brothers Haunted Circus are animatronic. Gossard employs between 125 to 140 actors to portray different characters and zombies, he said. Why do we look for fear? Part of the reason Neff and Baughman enjoy running the Lafayette Haunted Town Hall is they love terrifying other people, they said. The town hall is set up to induce fear from the moment visitors enter the attraction to the moment they leave, whether that is at the end or a premature exit, Neff said. The doors in each room have magnetic locks on them so the actors can induce the fear for as long as necessary before letting the visitors move on to the next room. Baughman said they have seen people enter the town hall determined to not be afraid and seen them screaming in terror only a room or two in. They’ve watched the tough man leading the group become so frightened they end up using their girlfriend or wife as a human shield. Despite those reactions, they have regulars returning each year to see what new addition they’ve made to the attraction. Those people who attend haunted attractions like these or Putnam County’s Haunted Cornfield in Ottawa or watch scary movies where others refuse to participate do so out of pleasure, said Susan Hawk, Chief of Clinical Integration Behavioral Health at Mercy Health-St. Rita’s Medical Center. For some people, facing fear in a controlled environment, like a haunted house, induces an adrenaline rush which raises the excitement level and triggers the pleasurable chemical reaction in the brain. It’s the same feeling some people get from a walk, bike ride or swimming in the open ocean with sharks, Hawk said. Every person in the world experiences pleasure from different sources, she said. Neff and Baughman said they have witness a couple of people in the haunted town hall who have completely shut down. One man just sat down on a chair and stared ahead of himself and barely responded when his children tried to get attention. He ended up having to be guided out by one of the secret exits. Hawk said in those instances the people are just overwhelmed by fear. Instead of the mind responding in a pleasurable way it is overloaded and shuts down. There are some people who have the opposite reaction to fear in a haunted attraction. For some people they have no response because they don’t think what they’re experiencing is scary. Fear is a subjective thing, Hawk said. For those people who enjoy terrifying themselves in celebration of Halloween Allen, Putnam and Auglaize counties have quality attractions for you.